Emily Ratajkowski is an actress and model best known for appearing in Gone Girl and the Blurred Lines music video. She’s supporting Senator Bernie Sanders in the democratic primary this election. Emily introduced Sanders at a rally on Monday, and you can watch her speech here. Emily posted about this to her various social media accounts, and while most of her fans were excited to see her support of Bernie, a number of people weren’t. This is what happens when you support Bernie Sanders online while female. First, people tell you to shut up and look pretty. People will also tell you you’re stupid. If you’re a woman who has at any point appeared without a top on, well, people will talk about your breasts. A lot. And those are actually some of the nicer things that happen. 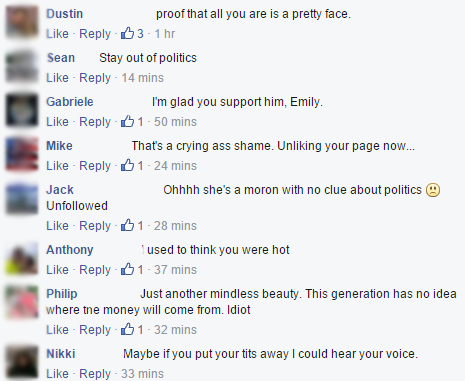 Those are just a fraction of the hate Emily has gotten for being a woman that supports Bernie Sanders. Most of these comments came within a few hours of her first post, so there’s plenty more insults and slurs to be found. You may be wondering what the significance of all this is, but there is none. Social media is often a toxic place, even more so for women. The companies running these websites do little or nothing to change the environment, and we continue to use their products in spite of that. So it goes. But in spite of the universal nature of online harassment, a number of prominent Hillary Clinton supporters in the media accused Sanders supporters of being uniquely vitriolic online. Their evidence? Offensive, sexist, and racist remarks from some Sanders supporters that are of the exact sort aimed at Ratajkowski’s today. Emily Ratajkowski found the internet to be no kinder to a woman who supports Bernie Sanders than it is to a woman who supports Hillary Clinton. Online harassment is a serious issue, and it would be great if both campaigns addressed it in a productive way. All the campaigns in this election are heavy users of social media and if they presented a unified platform to address online harassment it could possibly make social media companies to take the issue more seriously. However, by framing the discussion in a way meant to benefit Hillary Clinton alone, the pundits have accomplished little, save insulting Sanders supporters and deluding Bill Clinton into thinking sexism is an issue he can lecture about. With Clinton surrogates Madeline Albright and Gloria Steinem joining in with the online mob to hurl sexist insults at Sander’s female supporters coupled with the offensive spectacle of America’s most iconic practitioner of sexual harassment taking a stand on sexism, Hillary will likely need more than Bernie Bro thinkpieces to bridge the massive gap between her and Sanders among young women.